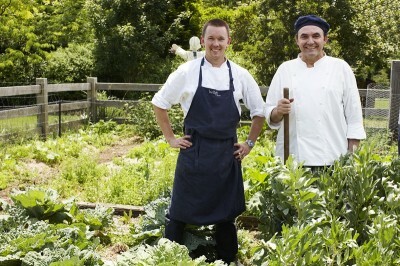 To kick off the school’s opening, Manfredi at Bells Head Chef, Cameron Cansdell will be hosting three dates for cooking classes for individuals, couples or small groups and each of our inaugural students will take home a complimentary Seasonal Italian Favorites cook book signed by Stefano Manfredi. 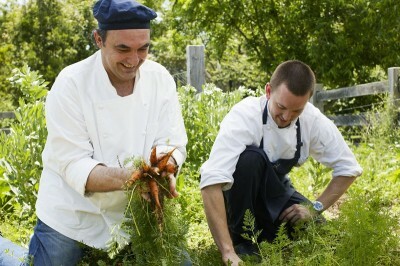 Expect to harvest beautiful seasonal produce fromStefano’s garden. Learn the secrets of the Manfredi at Bells kitchen as you prepare the bounty with Cameron in theManfredi at Bells kitchen. The dishes will then be enjoyed at a sit-down feast with Cameron and his team, paired with wines chosen from the multi award winning Bells at Killcare Wine list. Late summer sees a selection of beautiful tomatoes ripening in Stefano’s garden, as well as zucchini, basil, sage, eggplant and corn. Dishes will include some small, traditional antipasto dishes, fresh pasta, roast suckling lamb, pannacotta with muscat grapes. Heading into cooler autumn weather, this class will see guests harvesting vegetables such as young Treviso, rainbow chard, carrots, shallots and kohlrabi. Cameron will lead you to transform this wonderful fresh produce into dishes such as Treviso salad with soft Italian cheese, roast venison with chard, grilled local snapper and for the true chocolate lovers , dessert will feature Amedei chocolate. Heralding winter, purple fringe cabbages will be at their peak in early May and these, along with other beautiful seasonal produce, will be used to create the base of dishes such as roast suckling pig, grilled whiting fillets with fresh horseradish and an apple crumble with freshly churned gelato. Delicious. For more information, please contact Reservations on 4349-7000 or visit www.bellsatkillcare.com.au.